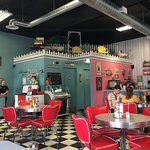 Description: Elsie's Diner is a 50's style licensed full service 64 seat diner incorporating the 50's style in both decor as well as food selection. 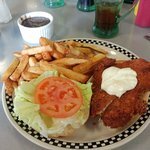 Our diner provides old fashioned home style meals using fresh local ingredients for eat in or take out. 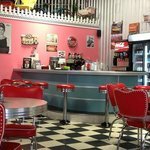 From the moment you enter Elsie's Diner you feel like you are stepping back in time. 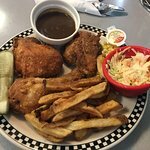 Customers can sit in a booth or a stool at the counter, enjoy our great 50's music and order a meal that they know is made fresh in our kitchen using local ingredients. 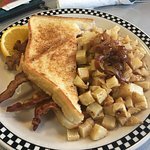 Our menu includes many old fashioned favorites like mac and cheese, meatloaf and burgers as well as floats, malt shakes and banana splits. 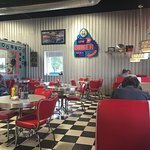 There are plenty of nostalgic signs and memorabilia to look at while they enjoy their meal or they can play the 50's trivia card game set at each table. A casual fun place to eat great home style food. On a quiet summer day at the restaurant, a friend and myself waited over an hour for lunch. I ordered a hot beef sandwich with mash potatoes. When our meal arrived, it was cold. My beverage (hot water with lemon) was so over chlorinated, I couldn't taste the lemon. The veggies had been over steamed. The waitress brought the wrong order for my friend. No, never again will we be back. I have heard some like the burgers there. The choice is yours. Atmosphere is great. Our wait staff Taylor was great. Asked for her recommendations and I ended up with the Reuben. It was delicious. Taylor new her stuff and was great at her job. We went for breakfast on Family Day. I had the Truman omelette and it was excellent. 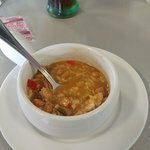 The service was very friendly, courteous and timely. Despite the resteraunt being busy, we did not feel rushed. I'm not a big fan of the coffee, however that is a very minor point. If you want to come here for the food don't waste your time. 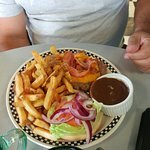 Typical diner food...burgers etc. The decor however is fun with lots of old posters around depicting old cars etc. Great place to eat. Good selection and prices. Place is always steady and clean. Service is always good and courteous. Like the 50's theme to the restaurant. 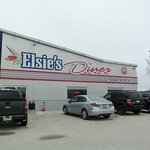 Been to Elsie's Diner? Share your experiences!